I spent a decade interviewing people to determine the best way to match a candidate’s talent to a specific role. During that time, I noticed what the best interviewees did right – and what a lot of people got wrong. 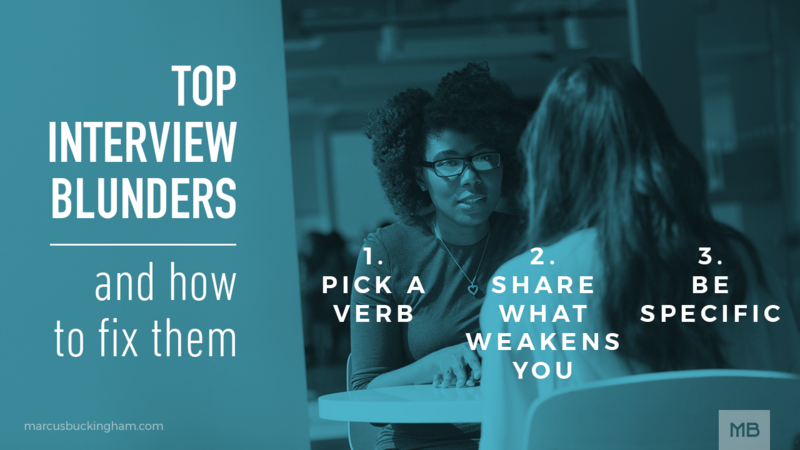 So although I believe it’s always better to focus on where you are strong, here are my top 3 interview blunders that you should stop doing right away, and what you can do instead. When someone asks you what your strengths are, do not say, “I love working with people.” You might truly love working with people, but not only is that the most common answer to that question, it’s also the vaguest. Instead, if you want to talk about people, talk specifically about what it is that you love about working with them. Do you like challenging them? Interviewing them? Persuading them? Pick a verb – figure out what you like doing with, to, or for people.